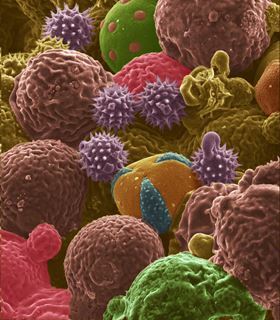 This scanning electron microscope image shows the bee pollen that was used to produce carbon anodes for lithium-ion batteries. Image: Purdue University image/Jialiang Tang. Pollen, the bane of allergy sufferers, could represent a boon for battery makers. In a paper in Scientific Reports, scientists from Purdue University highlight the potential of using pollen to produce anodes for lithium-ion batteries. "Our findings have demonstrated that renewable pollens could produce carbon architectures for anode applications in energy storage devices," said Vilas Pol, an associate professor in the School of Chemical Engineering and the School of Materials Engineering at Purdue University. Batteries have two electrodes, an anode and a cathode, separated by a liquid electrolyte. When charging a lithium-ion battery, lithium ions travel from the cathode to the anode, which in most of today's lithium-ion batteries is made from graphite. As a potential alternative to graphite, the researchers tested carbon derived from bee pollen and cattail pollen. "Both are abundantly available," said Pol, who worked with doctoral student Jialiang Tang. "The bottom line here is we want to learn something from nature that could be useful in creating better batteries with renewable feedstock." Whereas bee pollen is a mixture of different pollen types collected by honey bees, the cattail pollens all have the same shape. "I started looking into pollens when my mom told me she had developed pollen allergy symptoms about two years ago," Tang said. "I was fascinated by the beauty and diversity of pollen microstructures. But the idea of using them as battery anodes did not really kick in until I started working on battery research and learned more about carbonization of biomass." The researchers processed the pollen under high temperatures in a chamber containing argon gas using a procedure called pyrolysis, yielding pure carbon in the original shape of the pollen particles. The pollen-derived carbon was further processed, or ‘activated’, by heating it at a lower temperature – about 300°C – in the presence of oxygen. This caused pores to form in the carbon structure, increasing its energy-storage capacity. Pol and Tang found that the pollen anodes could be charged at various rates. While charging for 10 hours resulted in a full charge, charging them for only one hour resulted in greater than half of a full charge, Pol said. "The theoretical capacity of graphite is 372 milliamp hours per gram, and we achieved 200 milliamp hours after one hour of charging," he said. The researchers tested the carbon anodes at 25°C and 50°C to simulate a range of climates. "This is because the weather-based degradation of batteries is totally different in New Mexico compared to Indiana," Pol said. They found that anodes produced from cattail pollens performed better than anodes produced from bee pollen. This research is still ongoing. So far, Pol and Tang have tested the pollen-derived carbon anodes in isolation, but future research will involve incorporating them in a full-cell battery with a commercial cathode. "We are just introducing the fascinating concept here," Pol said. "Further work is needed to determine how practical it might be." Hay fever incidence is rising does materials science offer any answers? Automotive giant Audi AG and 3D printing pioneer EOS plan to build a 3D printing center.